Klim GTX Overshell: Run Through The Jungle! It’s 110 degrees in an equatorial rainforest and you are on day 10 of a two week adventure trip. The humidity is at 90% and the trail is giving you, and the bike, the toughest workout you’ve ever experienced. The only thing keeping you sane is the breeze that is mercifully making its way through your Klim Adventure Rally Air Jacket. You wish there was a break to the heat but it’s only 10:00AM and you still have the better (and hotter) part of the day yet to go. That’s when it happens. The sky darkens. The thunder cracks. The rain falls in buckets. You came prepared though. You remembered to pack your Klim Gore-Tex Overshell Jacket. 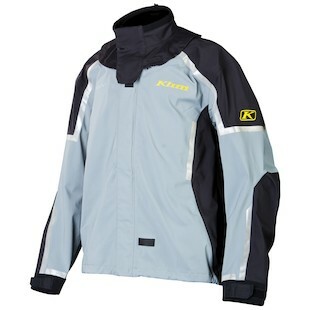 This piece was made to fit over top of your Klim Rally Air Jacket. The Rain washes away a bit of the heat and humidity and you are still bone-dry underneath your Overshell Jacket. The Gore-Tex 3-layer stretch performance fabric construction has shed all the water while at the same time allowing warm moist air to escape. The neoprene collar has created a snug seal underneath your helmet so no rain has trickled down your back and the neoprene cuffs have sealed up the wrists too. After the sudden deluge, your group continues on and since you did not get soaking wet, you ride out the rest of the day comfortably. Your heat-of-the-day hero is meant to pack down small in order to fit in a pocket as well as fit snugly over top of your jacket to reduce flapping at speed. It also has reflective panels so that you can be seen at night and in low-visibility situations. This jacket isn’t all about the survival skills though. It’s good in less harrowing conditions as well. Next time your tailgate is getting rained on, throw the Klim Gore-Tex Overshell Jacket on and regale your buds about the time it saved your backside in the jungle.